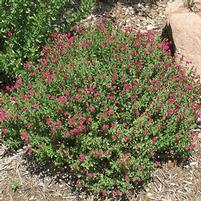 San Bruno Mountain is a versatile, easy-to-grow, evergreen perennial with a mounding growth habit. Yellow daisy-like flowers grace plants for much of the year. 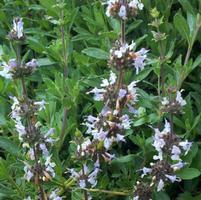 Its small size and long blooming season makes it a particularly good choice for small gardens. Golden aster is native to coastal dunes and headlands in coastal scrub from Mendocino County south to San Mateo County. This particular selection is from San Bruno Mountain which straddles the county line between San Mateo and San Francisco Counties. San Bruno Mountain is an easy-to-grow, low maintenance perennial. It forms a low mound of light green foliage about 8-10" tall and 18" wide. The leaves are covered with fine, silky white hairs which make them soft to the touch. Masses of bright sunshine yellow flowers, about ½-¾" across are produced from spring through fall. This is a versatile plant in terms of its light requirements. It's equally happy in full sun or dappled/light shade, whether you're gardening on the coast or in warmer inland areas. If you're in the Central Valley, you'll find golden aster is happier planted in a location where it's protected from the hot afternoon sun. 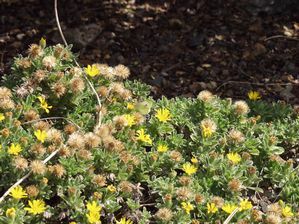 San Bruno Mountain golden aster tolerates most soil types from sandy to heavy clay. Just don't plant it in a spot where the soil's completely waterlogged for lengthy periods. New plants will benefit from being watered on a regular basis until they're established; about a year. Watering frequency and duration will depend on your location, soil type and the weather. In coastal areas, you might be able to get away with just giving new plants one really deep watering at the time of planting if you're planting in the fall or winter. Established plants should be able to survive on rainfall alone. San Bruno Mountain golden aster doesn't seem to be susceptible to any pests or diseases. Seed-eating birds value the seeds. 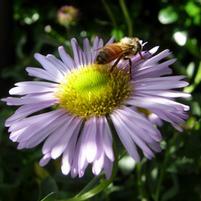 Butterflies, bees and other beneficial insects are attracted by the pollen and nectar. San Bruno Mountain golden aster's easy to root from semi-ripe stem cuttings. If you love deadheading, then removing the dead flowers on golden aster will certainly keep it looking neat and encourage more blooms. If you're more of a laid back gardener, then don't bother with regular deadheading; let the flowers go to seed and just relax and enjoy the fact you're providing birds with a valuable food source! If you live in a frost-free area, rejuvenate plants in late fall by cutting them back to about 2-3" from the ground. If you get frost, wait to do this until mid-late March.